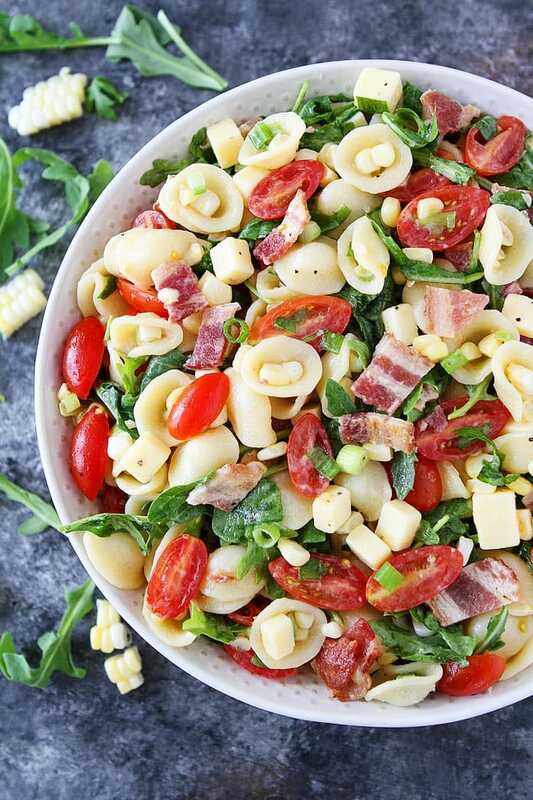 Bacon, Corn, and Tomato Pasta Salad-this easy pasta salad is the perfect summer side dish. Our family isn’t big on pasta salads with mayonnaise so this is a no mayo pasta salad. Don’t worry, the pasta doesn’t need the mayo, it is delicious without mayonnaise. Instead of a mayo dressing, I whisk up a simple Dijon mustard dressing. 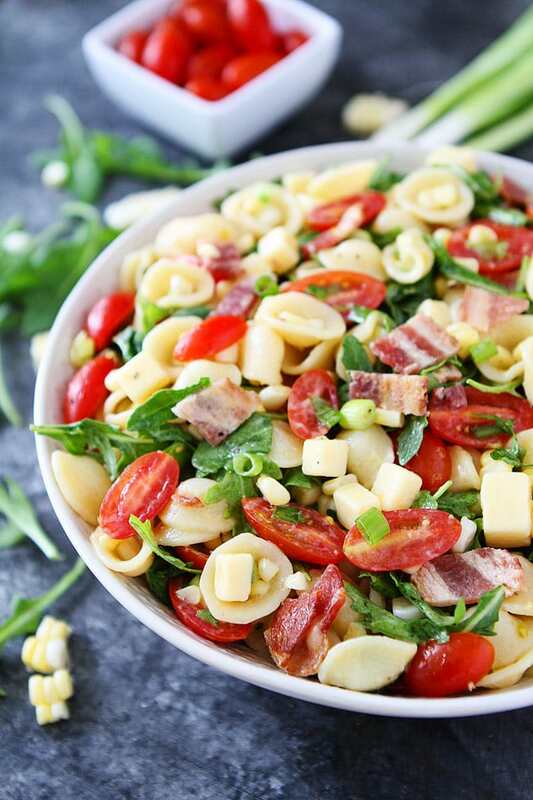 It only takes minutes to make and really makes the flavors of the pasta salad POP! You can cook the bacon in advance. We like to cook the bacon in the oven or smoke it on our Traeger Grill. Once cooked, place it on a plate lined with paper towels to remove excess grease. Place in a Ziploc bag and store in the refrigerator until ready to use. We like to use orecchiette pasta for this recipe. It is a nice size for pasta salad and the boys call the pasta “Mickey Mouse” ears. You don’t have to cook the sweet corn for this recipe. Just remove the corn kernels from the cob with a sharp knife and add them to the salad. If you don’t have fresh sweet corn, you can use thawed frozen corn. 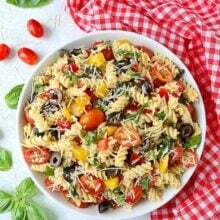 We use grape tomatoes for this pasta salad. Cherry tomatoes also work well. If you have a lot of large garden tomatoes to use up during the summer, you can chop them up and throw them in the pasta salad. We like to use white cheddar cheese, but regular cheddar or Gouda cheese is also fine. 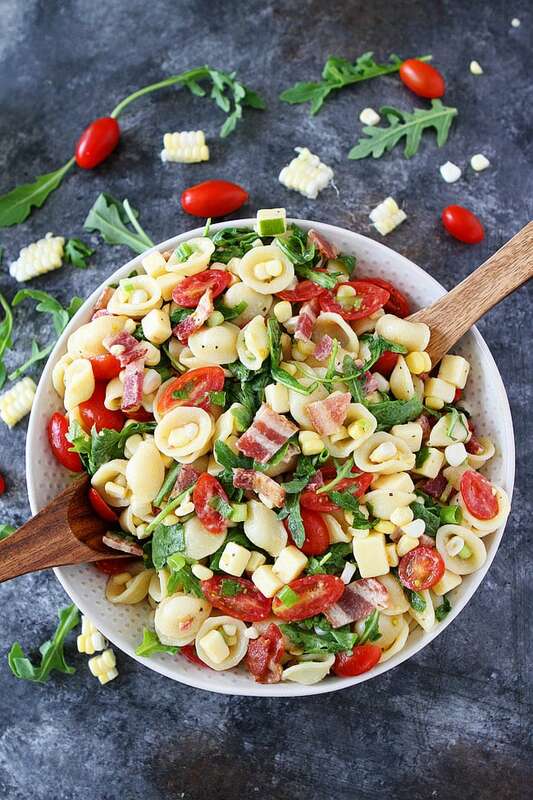 The next time you need to make an easy pasta salad, make this Bacon, Corn, and Tomato Pasta Salad. It is great for picnics, potlucks, parties, or an easy weeknight meal. Enjoy! 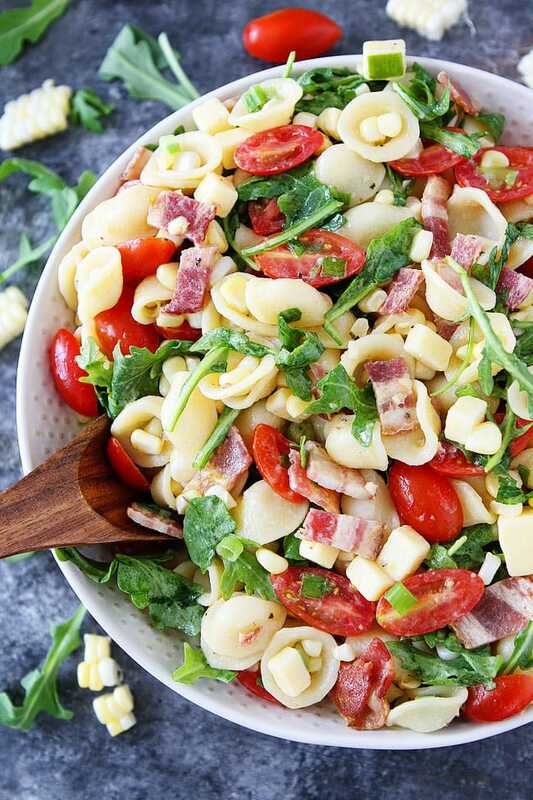 Everyone loves this easy pasta salad recipe with BACON! 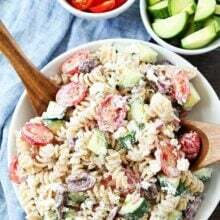 It is the perfect pasta salad for summer picnics, potlucks, and BBQ's! Cook the pasta according to package directions. While the pasta is cooking, make the dressing. In a small bowl or jar, whisk together the olive oil, lemon juice, Dijon mustard, honey, and garlic. Season with salt and black pepper, to taste. When the pasta is done cooking, drain and rinse with cold water. Put the pasta in a large bowl. 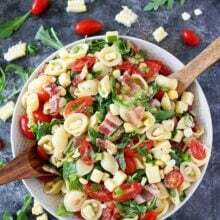 Add the chopped cooked bacon, tomatoes, corn, arugula, cheese, and green onions. 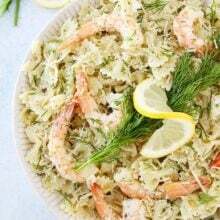 Drizzle the dressing over the pasta salad and toss well. Season with salt and pepper, to taste. Serve. Note-the pasta salad will keep in the refrigerator for up to 2 days. You had me at bacon and corn! I cannot wait to try this! The flavor combinations look so good! Such a perfect Summer side dish! 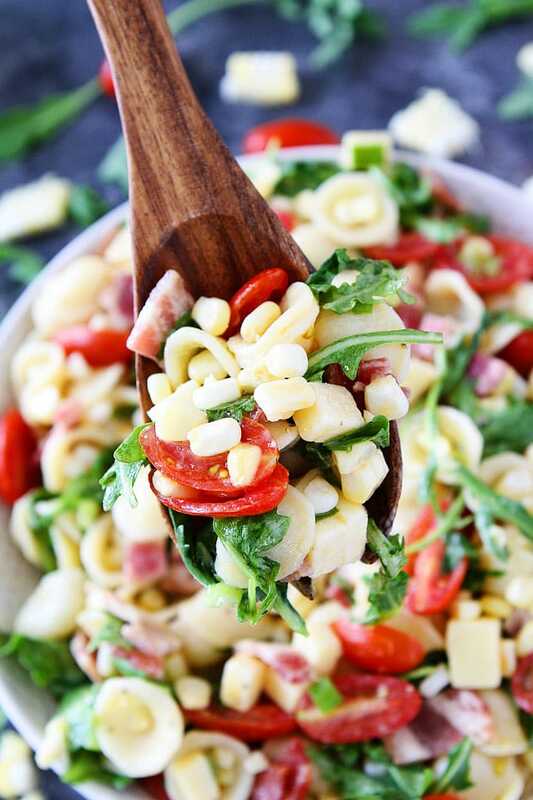 What a great pasta salad! Love the fresh corn and tomatoes in there! This looks delicious! It’s totally something I would make a big batch of for lunches. So perfect for corn season – love your mayo-less dressing! This looks like the perfect way to use up the last of our summer corn!! Gorgeous salad! Sorry,, I’m really bad about commenting. Just wanted to say that this recipe made a great lunch yesterday. I used what I had on hand. Omitted the bacon. Used mixed greens. No onion and used small amount of shredded cheddar cheese. Dressing is nice and light, compliments it perfectly. Thanks for another great recipe. Thanks so much for taking the time to comment! Glad you liked the pasta salad! Should I cook the corn before putting in the salad? Thanks! No, you don’t need to! It is great raw! Sorry, I just saw your tip that you don’t need to cook the sweet corn. Thank you! This pasta salad was fabulous! The dressing is anazing!! Great salad! I doubled the minced garlic and roasted the corn on the BBQ before I added it to salad. Delicious! I made this exactly as stated except half the bacon and rotisserie chicken in its place. I will definitely be making this again soon. Thanks! Hi! So I made everything, except adding the arugula, I thought it would be better to do before serving. Should I heat it up after I pull it out of the fridge add the arugula before I serve this? Or do you serve it cold? Remember, when you rinse the pasta in cool water, it won’t wilt the arugula. So go ahead and put it in as the recipe states. You can serve it cold or room temperature. Warm will melt the cheese chunks. Just WOW! 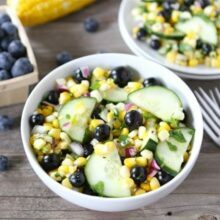 So tasty and light for a summer salad! There are endless variations! Ate it for lunch again today! Msde this one night and we ate the leftovers the next day! I had some hot/sour mustard and used that…what a nice kick it had! This is absolutely amazing! Sooo fresh and I used all my fresh garden produce for this! I didn’t have green onion, so substituted diced red onion. I also used a bag of salad blend mix and omitted the cheese (forgot to buy it). I will be making this again and again! Wonderful – the only change we made was to use your basil vinaigrette as dressing.